In some frustration I have been experiencing lately, I would like to share with the internet world the proper back-road driving etiquette. As a part of my job I drive my medical unit out to different locations. In doing so, I usually end up driving on a highway riddled with moose, deer and frost heaves in all sorts of weather conditions. And if that wasn’t bad enough, they then get us to drive on gravel/mud/ice “lease” roads to actually reach our site location. 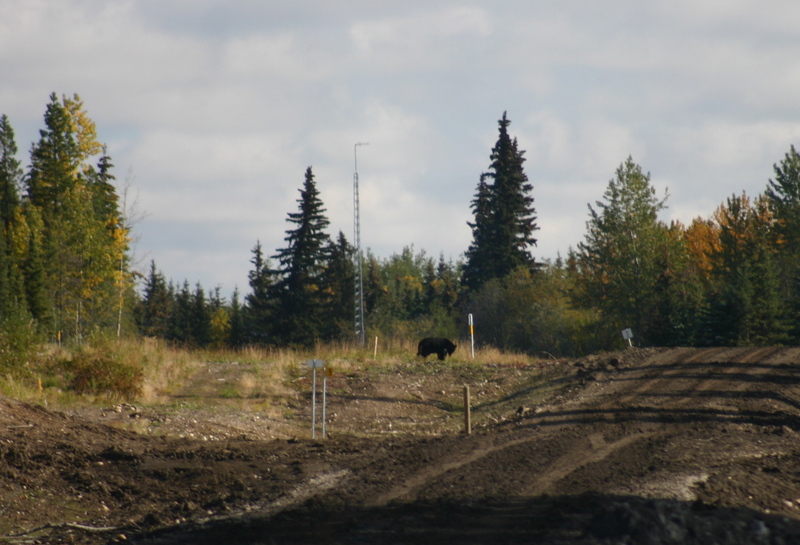 I will use the Alaska Highway as an example as it is a hub for all oilfield activity in BC. Just to confuse us, they decided to mark the highway in Miles starting at Dawson Creek, Fort St John is mile 32 and so on, all the way to Alaska. The roads that we work on are named with the number of the mile you are at, which tends to be rather confusing for us as we are given all of our directions in KM’s. Anyways, when you do find the lease road you were looking for, you then get to do the FUN part. Immediately upon turning onto the road you should pull over, there will be a sign posted somewhere in that vicinity stating the frequency that you should turn your radio to. Once you do this you should announce to everyone on the road what you are driving, which direction, and where you are. For insance: Pickup, empty at 0 on the 103. It’s very unfortunate but even these beginning steps are too hard for some, and it creates real danger for the others on the road. When you are leaving your site you call “loaded”, not because you are drunk, but because your logging truck would now be full! How exciting! The KM’s are marked in nice yellow, white, or sometimes even red signs easily seen from the road. This system is handy because on the thin, muddy, twisty turny roads it’s nice to be able to pull over and wait for someone to pass rather than risking a head on collision. One other thing that you will need to know is that “loaded” trucks always have the right of way, that means that if you are EMPTY you must be the one pulling over to let the loaded truck go by. This also is the case with one lane bridges. I also recommend when driving in the back road to follow the posted speed limit (usually 70KM/hr) and to anticipate road conditions and use 4×4 when appropriate. Have a road safety kit with you, as sometimes there is help nowhere near and no cell phone service in the area. You do NOT want to be stranded without the basics like food, warm clothes, water etc. Be sure to call A MINIMUM of every second KM on the road and when you arrive at your location announce “empty/loaded pickup clear the ___ rd at KM___. The radio is not a personal cell phone, you should not carry on in conversation with your friends, no matter how interesting YOU think your story is. Blabbering on and on makes it impossible for this system to work as only one person can talk on each frequency at a time. I have personally heard FAR too much personal information shared on the radio, keep those stories to yourself. If everyone follows these simple guidelines there’s a good chance that we will all be able to travel on these crazy roads and continue to do our jobs in a safe and respectful manner! For everyone that has never been on a back road and never used a radio, it can be fun, you CAN use nicknames like “rubber ducky” and you can use lingo like “10-4”. It’s something about my job that is unique and fun, and that you would never do while working in an office in downtown Vancouver. Hope everyone learned something from this very random post!